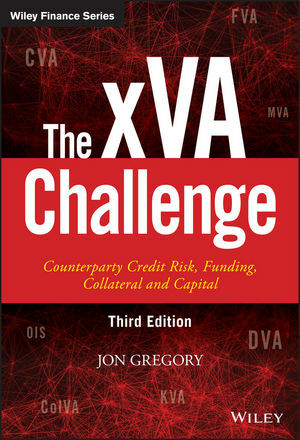 The xVA Challenge: Counterparty Credit Risk, Funding, Collateral, and Capital is a practical guide from one of the leading and most influential credit practitioners, Jon Gregory. Focusing on practical methods, this informative guide includes discussion around the latest regulatory requirements, market practice, and academic thinking. Beginning with a look at the emergence of counterparty risk during the recent global financial crisis, the discussion delves into the quantification of firm-wide credit exposure and risk mitigation methods, such as netting and collateral. It also discusses thoroughly the xVA terms, notably CVA, DVA, FVA, ColVA, and KVA and their interactions and overlaps. The discussion of other aspects such as wrong-way risks, hedging, stress testing, and xVA management within a financial institution are covered. The extensive coverage and detailed treatment of what has become an urgent topic makes this book an invaluable reference for any practitioner, policy maker, or student. Counterparty credit risk and related aspects such as funding, collateral, and capital have become key issues in recent years, now generally characterized by the term 'xVA'. This book provides practical, in-depth guidance toward all aspects of xVA management. The sudden realization of extensive counterparty risks has severely compromised the health of global financial markets. It's now a major point of action for all financial institutions, which have realized the growing importance of consistent treatment of collateral, funding, and capital alongside counterparty risk. The xVA Challenge: Counterparty Credit Risk, Funding, Collateral, and Capital provides expert perspective and real-world guidance for today's institutions. JON GREGORY is an independent expert specialising in counterparty risk and related aspects. He has worked on many aspects of credit risk in his career, being previously with Barclays Capital, BNP Paribas and Citigroup. He is a senior advisor for Solum Financial Derivatives Advisory and is a faculty member for the certificate of Quantitative Finance (CQR). Jon has a PhD from Cambridge University.